In November 2017, a long-lost Leonardo da Vinci painting was put up for sale at Christie’s semiannual, invitation-only evening auction. The work, called Salvator Mundi, was the star of the night: It sparked a 19-minute-long bidding war between two anonymous buyers and eventually sold for just over $450 million, the highest recorded price for a work of art. Just hours before the Times report on Prince Bader was published, the Louvre Abu Dhabi in the United Arab Emirates announced a new work would soon be on view at the museum: Salvator Mundi. But in September, just two weeks before the painting’s scheduled unveiling, Abu Dhabi’s Department of Culture and Tourism indefinitely postponed the exhibition. Reports began surfacing that the painting had gone missing, and its whereabouts have been a topic of fascination in the art world and beyond ever since, with some experts expressing concern that the delicate, 500-year-old piece is being mishandled or improperly stored. The most recent wave of interest was sparked by a post on a little-known Trump-Russia blog Narativ this month. Narativ published a theory that placed Salvator Mundi at the center of an international money laundering scheme implicating the royal families of Saudi Arabia and Abu Dhabi, along with Donald Trump’s 2016 presidential campaign staff, the Israeli intelligence firm Psy-Group, and the Russian potash fertilizer magnate Dmitry Rybolovlev, the painting’s previous owner. Rybolovlev, the Narativ post claimed, put the painting up for auction knowing that the Saudis and the Emiratis would bid for it, artificially inflating its value. Narativ posits the funds from the sale were then funneled to Psy-Group, which, according to a report by the Daily Beast, had ties to the Trump campaign. If this all sounds too convenient — and far-fetched — to be true, that’s because it probably is. Art world insiders have dismissed the Narativ story, contending that if the Saudis and the Emiratis were trying to funnel money to the Trump campaign, they wouldn’t have chosen such a high-profile work of art to do so. But the art world’s disdain for the theory hasn’t stopped other publications, including Vanity Fair and the liberal blog Wonkette, from spreading it further. And there’s a reason why it’s gotten so much attention: Outlandish as it may be, the Salvator Mundi conspiracy theory is indicative of the anxieties people have about our current political climate — as well as the opacity of the notoriously unregulated art market. The second is that the painting has since been lost. “As I write this, no-one has seen the rare masterpiece in over a year, and its exact whereabouts have been unknown for over 100 days,” Zev Shalev, the writer behind the theory, alleges. The question of why MBS, through Prince Bader, paid upward of $450 million for the painting is a bit more complicated. One simple explanation: Because he could. “Record-setting auction prizes are a gentleman’s sport to a certain extent,” said Davis. Auctions, at their core, are about getting astronomically wealthy people to pay vast sums of money for paintings and sculptures, and to make them feel very cultured for doing so. Another explanation is that driving the price of the painting to $450 million — the most money ever paid for a painting at auction — was a way of generating publicity for the Louvre Abu Dhabi, which opened a few days before the auction took place. Salvator Mundi was scheduled to debut at the Louvre Abu Dhabi in September 2018, but the unveiling was indefinitely postponed. Salvator Mundi, the last known da Vinci painting in private hands, has an incredible provenance. Rybolovlev purchased it for $127 million in 2013 through his art dealer, the Swiss businessman Yves Bouvier. Bouvier, the owner and operator of several freeports, bought the painting for $80 million with the intention of selling it to Rybolovlev at a steep profit. Its owner before Bouvier, the New York City-based gallerist Robert Simon, found the painting at an estate auction in New Orleans in 2005. He paid just $10,000. “It appeared to be a damaged, but worthy Renaissance-era work,” Simon told CNBC in 2017. “I thought it was beautiful but battered, and greatly overpainted. In my greatest imagination, I would have never thought it a da Vinci.” Prior to that, the painting had sold for just £45 ($58) at a 1958 Sotheby’s auction. The New York-based conservator Dianne Modestini restored the painting from 2007 until 2010, correcting 500 years’ worth of damage while also stripping off “layers of pride and distorting old overpaints,” according to a condition report released by Christie’s in 2017. The painting was on display at London’s National Gallery in 2011, where it was described as a genuine Leonardo. But the process of authenticating Salvador Mundi was a contentious one, and some scholars still contend that most of the work was painted by an assistant. Museums — especially new ones — need superstar works if they want to draw visitors. Acquiring the last privately owned da Vinci, particularly one with such fascinating provenance, is newsworthy enough as it is. The fact that it’s the most expensive painting ever sold only adds to Salvator Mundi’s appeal. The publicity around the painting may be a good way of drawing museum crowds, but it’s not ideal money laundering, a practice which requires secrecy in order to succeed. This lack of regulations, as well as the fact that art is highly portable and difficult to value, makes the art market highly suitable for money laundering, Adam said. Someone looking to launder money through art can use financial tools like trusts and freeports to “make a paper trail so difficult to follow” that investigators can’t begin to look into it. But, she added, there are very few proven cases of money laundering, again perhaps because they’re so difficult to investigate and also prosecute. That doesn’t mean people don’t get caught. Jho Low, the embattled Malaysian financier at the center of the 1MDB scandal, reportedly transferred tens of millions of dollars from the country’s publicly-owned strategic development company to buy art. (Low allegedly helped launder billions from the fund in total.) In 2017, Brazilian mining tycoon Bernardo Paz was convicted of rerouting more than $98 million in donations and loans meant for his outdoor art park Inhotim to pay for his business expenses. Edemar Cid Ferreira, a former banker from Brazil, was caught trying to smuggle an $8 million Basquiat into the US in 2007 by disguising it as a $100 work. US officials later returned 95 pieces from Ferreira’s collection to Brazil. It’s also important to note that some of the more unsavory parts of the art world — like using trusts to shield the identity of a painting’s true owner, or storing multimillion-dollar pieces in freeports away from the public to avoid paying taxes — are completely legal. As for Salvator Mundi, it’s true that the public doesn’t know the painting’s exact whereabouts, and the postponement of the unveiling is certainly odd. It’s also true that the unregulated nature of the art market makes it susceptible to money laundering. Still, there has been no reporting that special counsel Robert Mueller, who’s digging into the Russia investigation (including a reported Middle Eastern angle), is at all interested in this painting’s sale. Rybolovlev, who was charged with corruption and influence peddling in Monaco last year, does have ties to Donald Trump, or at least did in the past. In 2004, Trump bought a south Florida mansion — not Mar-a-Lago — for $41 million, which he then attempted to sell for $125 million to no avail. Rybolovlev paid $95 million for the property in 2008; at the time, he had an estimated net worth of $12.5 billion. Rybolovlev never lived in the house, but as Politico explains, “ultra high-end real estate sales are often detached from normal market forces,” and for a buyer like Rybolovlev, a high price tag may be an additional draw, much like with priceless works of art. None of this necessarily means that Rybolovlev is using any part of his art collection, including Salvator Mundi, to launder money; it may just mean he has a lot of money to blow. 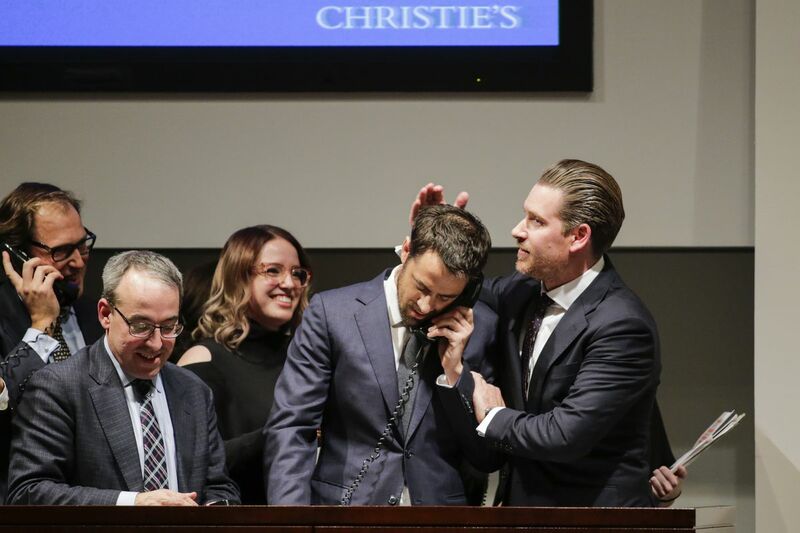 Agents celebrate after the Salvator Mundi sale at Christie’s in November 2017. The painting sold for more than $450 million. The Narativ post is far from the first Trump-Russia conspiracy theory to be put forward. As Vox’s Zack Beauchamp explained, liberal conspiracy theories are flourishing under Trump. Some of the more outlandish ones claim that both Sen. Bernie Sanders (I-VT) and Sean Hannity are working on behalf of the Kremlin; that Russians have managed to influence Jason Chaffetz and Paul Ryan, who refuse to investigate the president’s connections to Russia; and that Ayn Rand was a secret Russian agent. And, of course, there’s the pee tape. Conspiracy-mongers like Louise Mensch and Eric Garland have amassed hundreds of thousands of followers on Twitter, where they often claim everyone from reporters to Alexandria Ocasio-Cortez are also working for Putin. Even the most outlandish conspiracy theories are often rooted in a little bit of truth. Vladimir Putin has not, as far as we know, managed to convince reporters or members of Congress to do his bidding, though there’s plenty of evidence that some members of Trump’s campaign staff did collude with Russia. That doesn’t make most conspiracy theories true; it just means that, in the absence of a final verdict on the Trump-Russia situation, plenty of people are looking for answers. Davis, the Artnet writer who disputed the Salvator Mundi conspiracy theory, thinks that people who make up these elaborate stories of collusion can unwittingly discredit the more legitimate concerns people have about both the Trump administration and the art market. “There’s this sense that art is this weird other world that’s really opaque and sinister,” he said. Matthew Whitaker was set to testify before Congress. Then things got interesting.